The Department of State administers the Congressionally-mandated Diversity Immigrant Visa Program annually. Section 203(c) of the Immigration and Nationality Act (INA) provides for a class of immigrants known as “diversity immigrants” from countries with historically low rates of immigration to the United States. For Fiscal Year 2020, 50,000 Diversity Visas (DVs) will be available. There is no cost to register for the DV program. Applicants who are selected in the program (“selectees”) must meet simple but strict eligibility requirements to qualify for a diversity visa. The Department of State determine selectees through a randomized computer drawing. The Department of State distributes diversity visas among six geographic regions and no single country may receive more than seven percent of the available DVs in any one year. The confirmation number should not be made public. It should be printed and saved to check the status. Entering confirmation number at website will confirm whether the applicant has been selected or not. The result will be published on or after May 7, 2019. There is no cost to submit an E-DV form. > Name – last/family name, first name, middle name – exactly as on your passport. > Gender – male or female. > Birth date – day, month, year. > City where you were born. > Country where you were born – Use the name of the country currently used for the place where you were born. > Country of eligibility for the DV program – Your country of eligibility will normally be the same as your country of birth. Your country of eligibility is not related to where you live or your nationality, if it is different from your country of birth. If you were born in a country that is not eligible, please review the Frequently Asked Questions to see if there is another way you may be eligible. > Entrant photograph(s) – Recent photographs (taken within the last six months) of yourself, your spouse, and all your children. See Submitting a Digital Photograph for compositional and technical specifications. > Country where you live today. > Email address – An email address to which you have direct access, and will continue to have direct access after we notify selectees in May of next year. If your entry is selected and you respond to the notification of your selection through the Entrant Status Check, you will receive follow-up email communication from the Department of State notifying you that details of your immigrant visa interview are available on Entrant Status Check. The Department of State will never send you an email telling you that you have been selected for the DV program. See the Frequently Asked Questions for more information about the selection process. > Highest level of education you have achieved, as of today: (1) Primary school only, (2) Some high school, no diploma, (3) High school diploma, (4) Vocational school, (5) Some university courses, (6) University degree, (7) Some graduate-level courses, (8) Master’s degree, (9) Some doctoral level courses, and (10) Doctorate. See the Frequently Asked Questions for more information about educational requirements. > Current marital status – (1) Unmarried, (2) married and my spouse is NOT a U.S. citizen or U.S. Lawful Permanent Resident (LPR), (3) married and my spouse IS a U.S. citizen or U.S. LPR, (4) divorced, (5) widowed, or (6) legally separated. Enter the name, date of birth, gender, city/town of birth, and country of birth of your spouse, and a photograph of your spouse meeting the same technical specifications as your photo. > Number of children – List the name, date of birth, gender, city/town of birth, and country of birth for all living unmarried children under 21 years of age, regardless of whether they are living with you or intend to accompany or follow to join you, should you immigrate to the United States. Submit individual photographs of each of your children using the same technical specifications as your own photograph. - electronic entry, even if you are no longer legally married to the child’s parent, and even if the child does not currently reside with you and/or will not immigrate with you. Basically everybody can win a green card in the official DVLottery. The only exceptions are persons born in a country with a very high rate of emigration into the US. One’s country of citizenship is not important in this process. What is most important is the country of your birth, in accordance with current world political maps. Individuals who were born in any of the above-mentioned excluded countries may apply if their spouses were born in one of the eligible countries, or if the individuals were born in an excluded country while parents (both not born in this excluded country) of said individuals were only temporary residents of the excluded, non-eligible countries. The only other requirement is a certification of completion of secondary school education (comparable to the US high school diploma) or a minimum of two years’ work experience (within the past five years) in a profession which requires at least two years of training. Proof of these prerequisites are only necessary when and if a lottery participant wins a GreenCard. They are not necessary when you are simply submitting the application. You must list your partner/spouse (if you are married) and all your children under 21 years on your DVLottery application. Your spouse´s children must be listed too! Photos must be provided of all family members on the application! This does not mean that all family members have to immigrate to the US. After winning, the principal applicant can decide who to take along or not! However, all family members must be listed on the initial DV Lottery application to avoid disqualification! The submitted image to the DV Lottery must adhere to the following specifications. Photographs submitted for the DV Lottery must be a recent photograph, taken within the last 6 months. Failure to comply with any of the following requirements may result in disqualification from the DV Lottery. > The image file may be produced by acquiring an image with a digital camera or by digitizing a paper photograph with a scanner. > Digital enhancement or other alterations or retouching are not permitted. > The image must contain the full face, neck, and shoulders of the applicant in frontal view with a neutral, non-smiling expression and with eyes open and directed at the camera. > The image must not contain any parts of the body below the applicant’s shoulders. > The image must not include other objects or additional people. > Applicant must be vertically oriented in the image. > Subject must directly face the camera. > Head must not be tilted up, down, or to the side. > The head height (measured from the top of the head, including the hair, to the bottom of the chin) must be between 50% and 69% of the image?s total height. The eye height (measured from the bottom of the image to the level of the eyes) should be between 56% and 69% of the image’s height. The diagram below shows these measurements on a correctly-proportioned image. 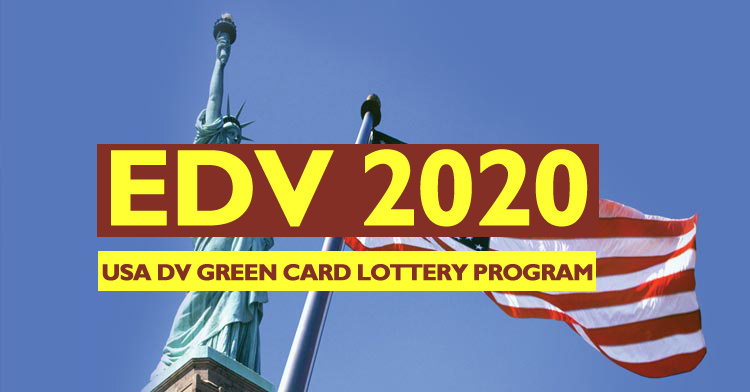 Entries for the 2020 Diversity Visa lottery must use the electronic Diversity Visa entry form (E-DV) at www.dvlottery.state.gov during the registration period.